In fact, it estimated that a far larger number of 65,000,000 people had been victimized in China, is still existing under the dictatorial political system, and still persecuting minorities and committing human right violations ceaselessly. Especially in Tibet, more than 1,200,000 people, corresponding to roughly 20% of the total population, were massacred since being unfairly annexed to Communist China in 1955. Even now, the people in Tibet are still abused, and their cultures are being destroyed. 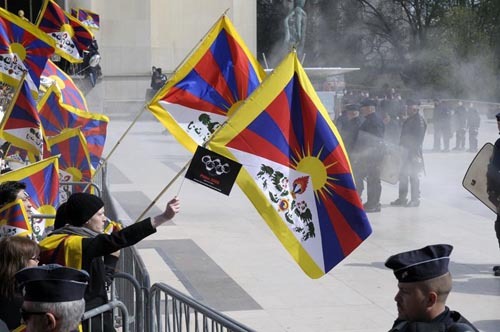 Groups such as the Madrid-based Committee to Support Tibet claim the death toll in Tibet since the 1950 People's Liberation Army invasion of Tibet to be 1,200,000 and have filed official charges of genocide against prominent Chinese leaders and officials. Since the revolt against Chinese rule in Tibet that began in 1956 and through the end of the Cultural Revolution in 1976, an estimated 1, 200, 000 Tibetans were killed and more than 6, 000 religious sites were destroyed. In 1959, 1960, 1964, and 1997 the International Commission of Jurists examined Chinese policy in Tibet, violations of human rights in Tibet, and the position of Tibet in international law. The International Commission of Jurists found that the People's Republic of China had committed `acts of genocide . . . in Tibet in an attempt to destroy the Tibetans as a religious group' and that Tibet was at least `a de facto state' prior to 1951. Figures compiled by the Tibetan Government-in-Exile. In fact, China wants to control the East Turkistan too. Redundant China's hunger for its political and territorial control extends even to East Turkistan, where its people's struggles for independence from China continue to this day. There stands a building within the East Turkistan territory constructed by the Chinese earlier, which China claims to have built it during the ancient Chinese Kingdom period. Therefore, the East Turkistan belonged to China. The idea of propping up some buildings within the East Turkistan borders and professing that China had controlled the region from the ancient times to be the truth, thereby claiming that East Turkistan belonged to the Chinese is preposterous. However, a radiocarbon dating investigation has revealed that the same structure was constructed just 5 years ago, according to the President of the Japan Uyghur Association, Ilham Mahmut. China always tells lies. It is natural Uighurs raise an objection to Beijing because the 3000 of armed Chinese attacked 200 of the Uyghur people while Uighurs were walking back to their dormitories from workshops on June, 25 2009 PM 11:30. Only 10 of the Uighurs survived. The Uyghur ladies were raped by the Chinese men. It is inexcusable that they have no respect for our human rights. The United States Congress to rename a section of the street that runs in front of the Chinese Embassy in Washington “Liu Xiaobo Plaza,” is a great action because people should not shrug Chinese lies off anymore. It was written by the New York Times, DIDI KIRSTEN TATLOW in JUNE 25, 2014. A “complete farce” celebrating a convicted criminal, or a necessary reminder to China of its obligations to uphold international human rights standards? Responses to the effort in the United States Congress to rename a section of the street that runs in front of the Chinese Embassy in Washington “Liu Xiaobo Plaza,” after the imprisoned Chinese Nobel Peace laureate, are gathering heat. On Wednesday, a spokeswoman for the Chinese Ministry of Foreign Affairs, Hua Chunying, dismissed the congressional move as a “complete farce,” and restated the government’s position that Mr. Liu is a criminal who broke Chinese law and has been punished accordingly. Asked if China would retaliate by renaming the street in front of the United States Embassy in Beijing, she gave a big smile and asked, “Do you believe China should take the same action as the U.S.?”I am sure that China hates this situation because any senders need to write Liu’s name as an address on any mail and boxes for Chinese Embassy in Washington D.C. Not only this, the stuffs in Chinese Embassy need to write his name as return address. As the same way they need to use Liu’s name on their own web site. Why do I agree to change the address? I will give you for the reasons. First reason is China has been trampling upon human right. One of the ladies who have lived in the U.K got a message which was slipped into a dress imported from China. The message says, “Help! I am forced to work over 15 hours every day.” Also, it estimated that a far larger number of 65,000,000 people had been victimized in China is still existing under the dictatorial political system. Nevertheless, China is telling lies. Communists say we treated Chinese citizens softly even though they have killed many innocent people. We should not be cheated by Chinese government. Secondly, do you know the Uighurs in East Turkestan problem? Chinese soldiers have killed many Uighurs people with arms. China has appealed Rebiya Kadeer, who is a Uighur lady leader of East Turkestan, is a terrorist. However, the story does not have any proof. And then, it restricted freedom of speech in China. As for Tibet, more than 1,200,000 people, corresponding to roughly 20% of the total population, were massacred since being unfairly annexed to Communist China in 1955. Even now, the people in Tibet are still abused, and their cultures are being destroyed. As for the awarding of the 2010 Nobel Peace Prize to the Chinese writer and human rights activist Liu Xiaobo, we will know that China does not open its nation. When mass media form foreign countries visit Liu, Chinese government took Liu’s wife out for shopping in front of cameras. Usually they are confined in their own house.Of course the scene was staged. Why China need to do such a stupid act? China wants its people should look at bright side only. China is afraid of being accused from Chinese people about human right problems. In conclusion, the United States Congress to rename a section of the street that runs in front of the Chinese Embassy in Washington “Liu Xiaobo Plaza,” is a great action because people should not shrug Chinese lies off anymore.